Bergerud, A.t.. "Caribou". The Canadian Encyclopedia, 01 August 2018, Historica Canada. https://www.thecanadianencyclopedia.ca/en/article/caribou. Accessed 24 April 2019. Caribou are members of the deer family. They may be further categorized based on where they live and how they behave. 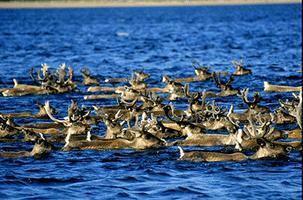 Caribou in Canada are generally categorized into three types: peary, barren-ground and woodland. Taken together, caribou are found in most Canadian provinces and territories, with the exception of the Maritimes. The caribou (Rangifer tarandus) are members of the deer family (Cervidae). They range in size depending on the subspecies, with males weighing between 125–275 kg, females 90 kg–139 kg and new-born calves 5–9 kg. Caribou are unique among members of the deer family in that both females and males have antlers. 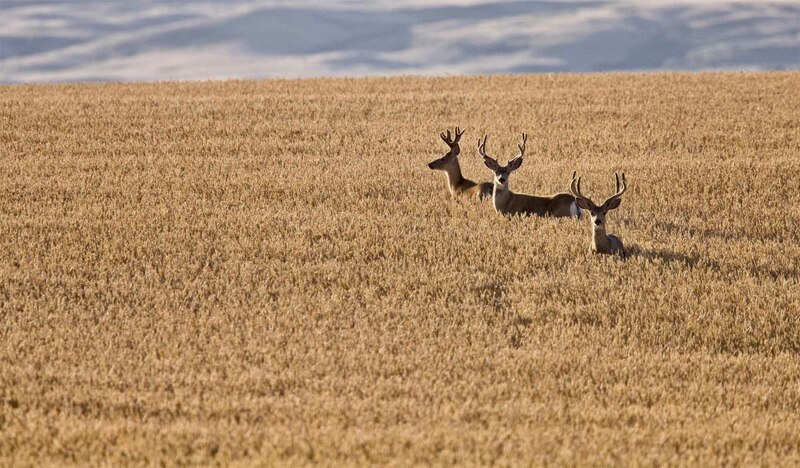 Adult males have tall antlers with flat, hand-like projections, while females have smaller versions. Coat colour varies from nearly white in some tundra populations to dark brown in woodland herds, and shifts from season to season (darker in the summer, lighter in the winter). Caribou hooves are broad and the fur surrounding them is dense with hollow hairs — adaptations for warmth and swimming. They are the strongest swimmer of the deer family as well as the best runner; both qualities improve their ability to escape from predators. 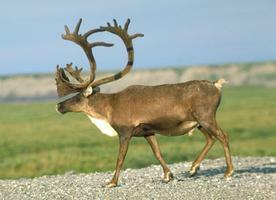 The caribou evolved in North America and spread to Eurasia where they are known as reindeer. The earliest fossils of caribou in North America are 1.3–1.8 million years of age and are from Alaska and northwestern Yukon. These animals became the barren-ground caribou (R.t. groenlandicus), spreading east to Hudson Bay. Today, barren-ground caribou are found in the tundra stretching from Alaska to Baffin Island. Woodland caribou (R.t. caribou) survived the Pleistocene epoch, sometimes known as the Great Ice Age, in the Appalachian Mountains. They then moved north, reaching the Ontario and Québec regions 10,000 years ago. They also colonized the Québec-Labrador Peninsula. Today, the woodland caribou live in almost all Canadian provinces and territories, with the exception of Nunavut and the Maritime provinces. Peary caribou (R.t. pearyi) possibly survived the Pleistocene on Banks Island and later spread to the Queen Elizabeth Islands. 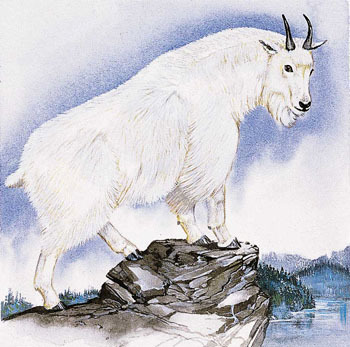 They are still found there today, living entirely within Canada’s Arctic Archipelago. 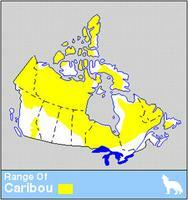 Barren-ground caribou are probably the most wide-ranging land mammal in North America. In the spring some barren-ground females migrate en masse hundreds of kilometres to Arctic calving grounds that have reduced forage, late phenology (i.e., when green plants begin to appear in spring) and often some snow cover. This migration results in spacing away from the treeline where wolves commonly den, and therefore improves calf survival. 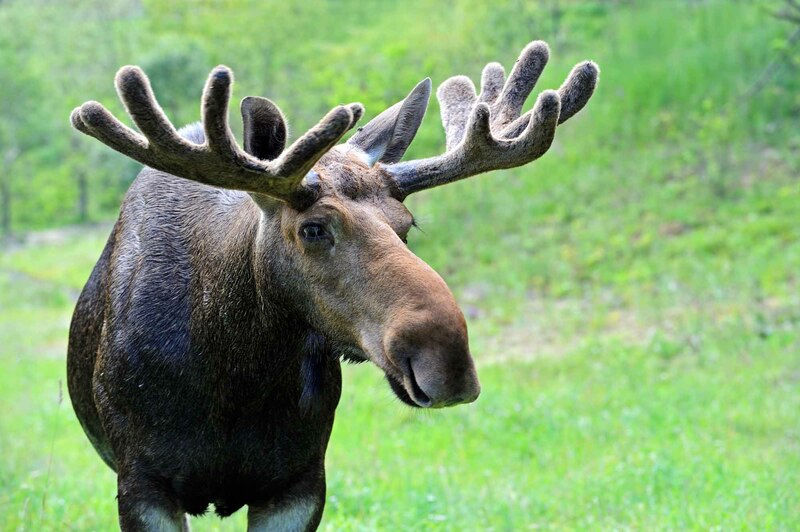 Woodland females migrate generally less than 50 km, and disperse away from other females and animals their predators may also prey on, such as moose. They seek high mountain slopes, islands or shorelines where they can reduce the probability of being found by predators or increase escape by swimming. Single calves are born in May or June. Gestation is about 228–234 days and the mating season is in October. Maximum longevity is about 13 years for males and 17 years for females. Age of first breeding (one to three years of age) depends on body size, meaning summer nutrition is important. Caribou have several mates. Males seek nutritious forage to maximize body size for competition with other males. The reproductive fitness of females is enhanced by choosing safe habitats to raise her single calf. This dichotomy has resulted in females being more wary than males. Many Aboriginal peoples hunt caribou for subsistence purposes, waiting each year for the long line of migrating caribou that trek in single file down trails followed for millennia. 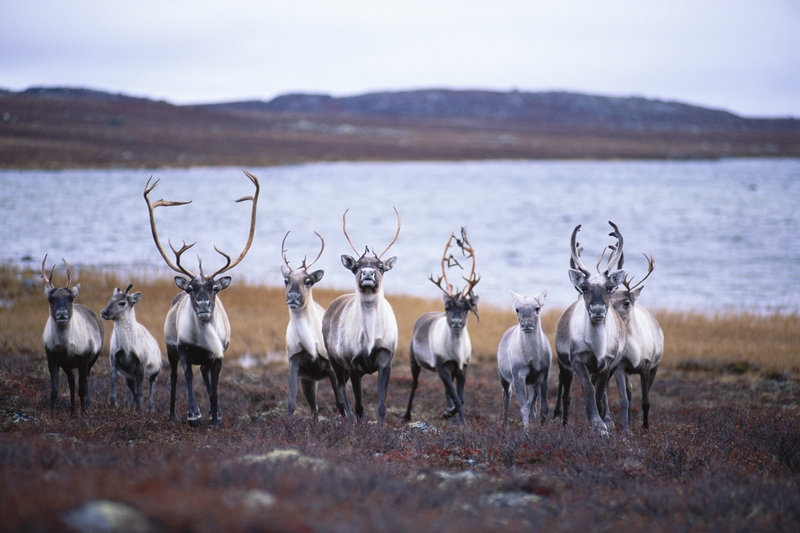 Some Aboriginal groups have been instrumental in protecting the habitat of certain caribou populations, for example in Tuktut Nogait and Vuntut national parks. Key to the decline of the woodland caribou is habitat loss. The reasons for habitat loss may include industrial activity, such as forestry and mining, and the often-related construction of roads and pipelines. Global warming also affects caribou. Warmer temperatures have allowed moose and deer to move further north, and since the abundance of predators depends on the abundance of their prey, wolves, cougars and coyotes are also expanding their ranges and increasing in population. Southern woodland caribou, unlike moose and deer, cannot coexist with such high predator numbers and will go extinct unless humans intervene.